Our Dance projects are based in the medieval city of Brasov. Once a month, volunteers will prepare a show which includes a story based on a variety of types of studied dances. This would be planned under the guidance and coordination of our Dance Project Supervisor, Alexandra Ichim. 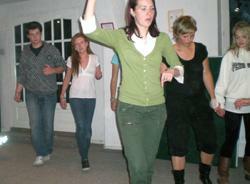 Volunteers have the chance to prepare, direct and perform dancing routines for children in orphanages and day centres. As part of these projects you will also learn traditional Romanian dances, which can be included in the shows.